Since I'd been skulking around a lot of the remains of the former footprint of Fort MacArthur at the LA Harbor, I figured it was time I chased down the actual fort. But it turns out, that's actually more complicated than it seems—because there's still technically an active Fort MacArthur LA Air Force Base, plus Fort MacArthur Museum, plus property still technically owned by Fort MacArthur but leased to other businesses and organizations. ...and home of the now obsolete "Disappearing Gun," which was mounted in a special carriage that allowed it to retract after firing—making any kind of precise retaliation something like playing a game of Whack-a-Mole. After that, it was converted into a command post, all fire power having been removed. It also served as the Integrated Fire Control site for the White Point NIKE missile site (photos coming soon) for 20 years, until the end of the program in 1976. ...and considered "off-limits" to the public. ...though it's pretty well locked up to keep trespassers out of the interior. ...and tucked behind facilities run by the Coast Guard and the Marine Exchange of Southern California, which acts as kind of an air traffic control tower, but for the vessels at sea. Even better-hidden is the Battery Barlow-Saxton, also from 1919, which is fenced off from the adjacent San Pedro High School Olguin Campus and Point Fermin Outdoor Education Center. Its lateral arrangement of four two-gun pits is the only one you'll find in the lower 48 states, and its guns were able to turn 360 degrees—including away from the ocean, towards the town—in case attacks came from any direction. Because this one is even more off-limits, I got shoo-ed away before I could get any closer to it. It's considered at least one of the best preserved examples of a coastal defense gun emplacement in the U.S., and hence was landmarked on a national level in the year of our Bicentennial. The Army had been using it for various purposes up until just two years before, and hadn't made many changes to it since the guns had been declared surplus and sold for scrap metal in 1946. ...to the era of the anti-aircraft missile (that is, the NIKE program). ...that was placed into the restored power room in 2007. Now and then, they crank it up to deafening decibels for enthusiastic spectators willing to plug their ears. ...and, to some, as the "Battle of Los Angeles." ...by some kind of "flying object" that the search lights failed to illuminate enough to figure out exactly what it was. The air raid sirens were sounded, nearly the entire coast of Southern California was blacked out by military order, and guns fired for nearly an hour in the middle of the night at...something. Although LA hadn't actually been attacked, the LA harbor had been operating under martial law since the bombing of Pearl Harbor just a couple of months prior—with paranoia at an all-time high. But what was it that they had spotted in the sky and subsequently started shooting at for an hour? The Glendale News-Press named it a "mystery invader." The St. Cloud Daily Times identified it as an "enemy blimp." 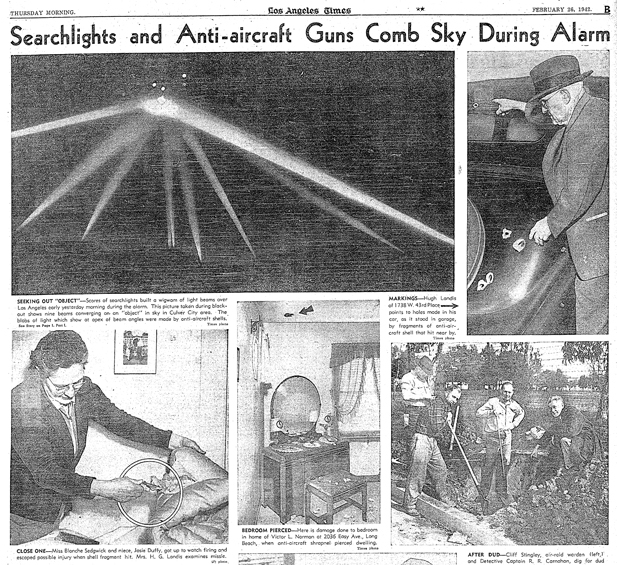 And the Long Beach Press-Telegram simply called them "strange planes." Could it have been the Japanese? The Germans? Civilian aircraft? Aliens? A weather balloon? Every witness—and there were a lot of them—had a different story of what they saw up there as the shooters lit up the night sky. Maybe it was just a "false alarm"—nothing to blame but "war nerves" getting the best of those whose fingers were on the trigger, and the mass hysteria that grew as the events of the evening unfolded. Regardless, although no bombs were dropped, no planes were shot down, and no troops were killed, civilian causes of death ranged from car accidents in the blackout and heart attacks to falling shrapnel and unexploded ordnances that later, well, exploded. The truth is probably out there somewhere. But maybe the speculation makes this a better Hollywood legend.